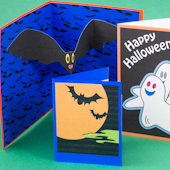 Give your friends or family members a little fright with these easy-to-make Halloween pop-up cards! 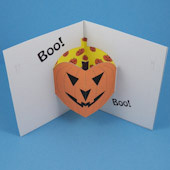 In practically no time, you can make a special Halloween card with a jack-o'-lantern pop-up inside. 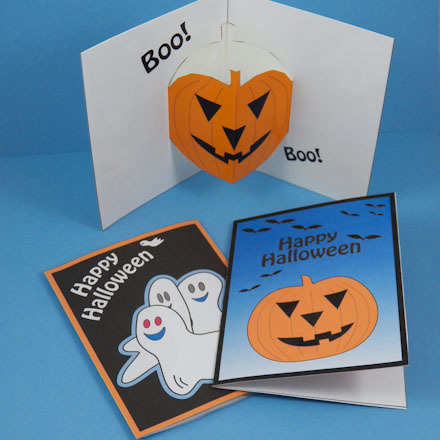 The project includes black & white and colored patterns for two Halloween card designs, and printable patterns for separate jack-o'-lantern and bat pop-ups that can be added to your handmade or commercial cards. This simple pop-up is easy enough for children to make and offers enough flexibility for the creativity of teen and adult crafters. Related crafts: For more pop-up cards and easy to make greeting cards, see the projects listed in Greeting Cards Kids Can Make. Choose the card you want to make, and download the pattern. Each pattern has two pieces: the top piece is the outside of the card, and the bottom piece is the inside of the card. Print the pattern on white paper or cardstock. The card will be sturdier if it is made with cardstock. 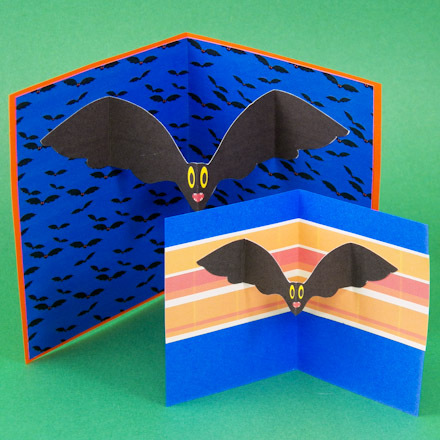 Bat pop-up card: Make the bat pop-up card following the instructions for the jack-o'-lantern pop-up. Tip: You can also add a jack-o'-lantern pop-up to any handmade or commercial card using the Separate Pop-Ups pattern below. 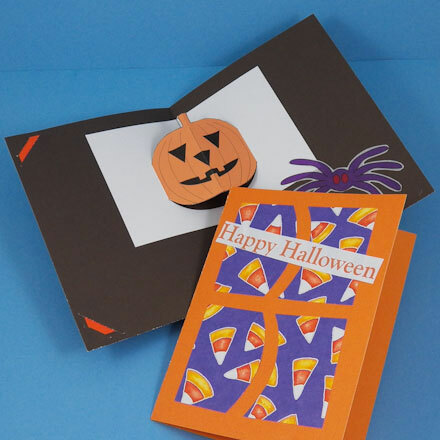 This pattern includes jack-o'-lantern pop-ups in four sizes; the largest size fits the cards made in Aunt Annie's greeting card tutorials, including the Leaf Silhouette Cards. To use these pop-ups, pick one that fits inside your card and follow the directions below for making the pop-up and gluing it inside a card. Tip: Separate Bat Pop-ups can also be added to the cards in this project or other cards following the instructions for the jack-o'-lantern pop-up. Be sure to cut no further that the red dots. Part of the bat wings remain uncut so that the pop-up hides inside your card. Pick any colors you like to color the card. Pick orange for the jack-o'-lantern, or do something wild! How about polka dots or zigzag stripes? Use your imagination! Cut out each pattern piece on the solid black outline. Try to make your cuts very straight. The card will look better and fit together more easily with straight edges. Tip: It is easier to make straight cuts with a craft knife and ruler. Protect the table with thick cardboard or a cutting mat. Place the ruler along the line to be cut, then carefully draw the craft knife along the ruler's edge. Be sure to keep your fingertips away from the knife. Kids, get adult help when using a craft knife! Fold both card pieces in half on the center line. Fold them so that the marks are on the outside. If you are using cardstock, score the fold lines first. The pop-up is on the inside card piece and is folded in half. Cut around the jack-o'-lantern on the solid line, leaving the unmarked edge of the pumpkin uncut. Fold the pop-up back and forth along this uncut edge. Tip: If you are making the bat pop-up card or using the separate bat pop-ups, cut out the bat on the outline—stopping at the red dots. The tips of the bat wings must remain uncut so that the folded pop-up hides inside the card when the card is folded close. Optionally, you can cut out the bat entirely and fold the wings at the red dots, and then glue the wing tips to the card with the centerfolds of the bat and the card aligned. Unfold the card's inside piece, and refold it the opposite way. Open the card and pull the pop-up toward you. Change the pop-up from a valley fold to a mountain fold. Fold the card in half and press to sharpen the creases. Put glue on one half of the inside piece. Slide the two card parts together. That is, put the pop-up piece inside of the card's outside piece. Press. Turn the card over and put glue on the other half of the inside piece. Press again. Be careful not to get any glue on the jack-o'-lantern pop-up. Tip: Cards can be made with paper, glossy photo paper or cardstock. 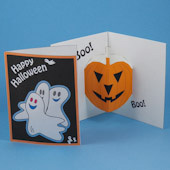 Tip: Add the separate jack-o'-lantern pop-ups to Four Patch Cards, Bookmark Cards and Leaf Silhouette cards. Use the Halloween Candy Corn ePaper to make Halloween-themed Four Patch Cards. 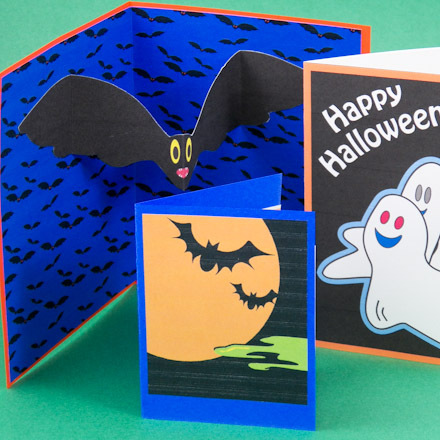 Tip: You can also add the separate bat pop-ups to the cards in this project or to any Halloween greeting card. Tip: To back the jack-o'-lantern pop-up cutout with decorative paper, glue a rectangle of fancy paper between the card's outside and inside pieces. One of Aunt Annie's Halloween ePapers was used to back this pop-up.